Major players in the earbuds market are focusing on working in accordance with consumer demand, for example - the need for earbuds that manage a striking balance between cost and performance. The market is highly competitive and fragmented, with new players emerging across all cost categories. 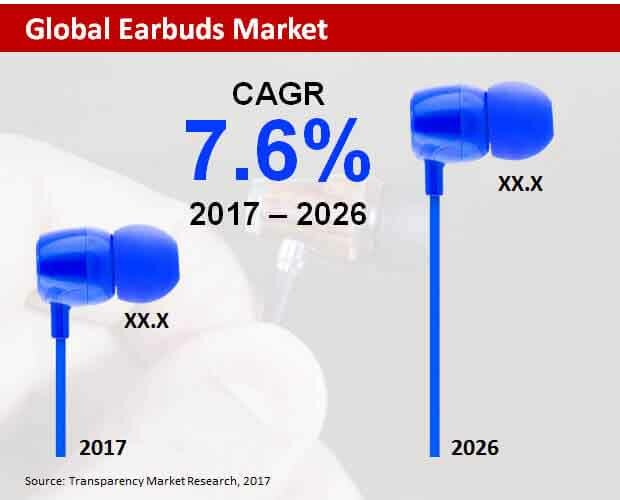 Transparency Market Research’s recent report has listed key companies underpinning growth of the earbuds market globally, which include Panasonic, JBL, Samsung, Jabra, DENON, KOSS, Philips, Yamaha, LG Electronics Inc., Sennheiser Sony, Bose, and Apple Inc. (Beats Electronics). The global market for earbuds is characterized by the demand innovation and increasing competition, wherein manufacturers lay an extra emphasis on the exploration of wireless connectivity, provision of feature-oriented products, and improved noise-cancelling functionality for enabling faster penetration across the globe. According to TMR, the global earbuds market will reflect an impressive expansion during the forecast period (2017-2026). Approximately US$ 19,000 Mn worth of earbuds are estimated to be sold across the globe by 2026-end. Current publicity prevailing in the global earbuds market is not a fad, but deemed as the industry’s future. Robust adoption of earbuds can be highly ascribed to increasing number of individuals who are constantly hitched to smart devices that include mobile phones, music players, and tablets for significant duration, mainly for playing games, watching videos, or listening music. Additionally, several individuals are witnessed treading around with earbuds and listening to music. At present, most of the earbuds users are seeking trendy and fashionable options, and the trend gaining immense momentum globally is the inclination towards wireless earbuds incorporated with Bluetooth connectivity. The wireless earbuds have been witnessing improvements in every aspect, for example - battery backup, thereby becoming competitive with their wired counterparts in all possible ways. It is only been a while that earbuds have gained paramount importance as an accessory, backed by growing penetration of smartphones. Commenced from initial corded versions, earbuds have witnessed evolution into various shapes & sizes, meanwhile being integrated with myriad functions. Improvements and innovations in wireless earbuds are less likely to display a downward graph in the foreseeable future, with manufacturers increasingly putting efforts for developing Bluetooth earbuds that are affordable, have longer lifespan, and offer better sound quality. Many companies are concentrating on the introduction of wireless earbuds, where each product has unique features beyond audio including microphones for handsfree calls, processing ambient sound for better clarity, and fitness & health monitoring. North America is anticipated to remain the leading revenue contributor to the global earbuds market, accounting for over 40% share of the market by 2026-end. Revenues from the market in Europe will also remain high during the forecast period. However, sales of earbuds in Asia-Pacific excluding Japan (APEJ) are projected to register a relatively faster expansion than that in all the other regional segments included in the report through 2026. In-ear earbuds are expected to remain preferred among products in the market, with sales accounting for nearly two-third revenue share of the market by 2026-end. Over-ear earbuds will continue to be less lucrative in the market during the forecast period. Multi-branded stores will prevail as the leading distribution channel for earbuds worldwide, trailed by exclusive stores. Revenues from these two distribution channels for earbuds are collectively projected to hold roughly 70% share of the market by 2026-end. However, in terms of sales expansion, online stores and hypermarket/supermarket will continue to be dominant distribution channels for earbuds. Android will endure as the preferred user operating system for earbuds through 2026. Revenues from earbuds compatible with iOS user operating system will remain slightly lower than those compatible with their Android counterparts throughout the forecast period.